MOSCOW, September 22. /TASS/. The Russian Paralympic Committee (RPC) has transferred to the International Paralympic Committee (IPC) the first portion of the money that it should pay to compensate for IPC’s losses related to the suspension of its membership. RPC was obliged to pay 257,500 euro to compensate for enhanced doping testing of Russian Paralympic athletes and the functioning of an IPC working group to reinstate the Russian membership. After the Executive Council of the world’s anti-doping agency WADA resolved to reinstate the membership of Russia’s anti-doping body RUSADA, RPC First Vice President Pavel Rozhkov and IPC Chief Operating Officer Mike Peters discussed the issue of compensations by phone. "On the basis of the agreements that had been reached, the Paralympic Committee of Russia made the first payments in line with the documents, provided by the International Paralympic Committee," an RPC official told TASS. "The RPC will make another series of payments next week, after receiving the originals of the accounting documents from the IPC." The WADA Executive Committee of the World Anti-Doping Agency decided to reinstate the RUSADA at a meeting in the Seychelles on September 20. Shortly after, IPC President Andrew Parsons said that "a lot of work that still needs to be done" to reinstate the RPC membership. "We do not expect the IPC Taskforce to provide any recommendations to the IPC Governing Board until the criterion related to the IPC’s reimbursement costs associated with the suspension is satisfied," he added. The IPC suspended the Russian Paralympic Committee in August 2016 in the wake of a report about a state-sponsored doping system in Russia, presented by the World Anti-Doping Agency (WADA) Independent Commission headed by Richard McLaren. The reimbursement costs RPC must pay to the IPC currently stand at 257,500 euros and concern the IPC testing program of Russian Para athletes and the IPC Taskforce. 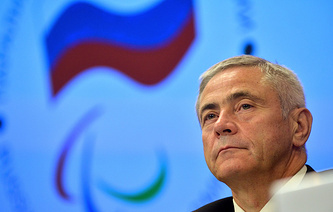 The IPC Governing Board maintained the suspension of the Russian Paralympic Committee at the September 12 meeting.